Ben Affleck to Exit Batman Role and DC Altogether? Fans of the DC Extended Universe were dealt a pretty big blow yesterday when it was officially announced that Ben Affleck would not be directing the upcoming standalone Batman movie. He, at least as of right now, is planning on co-writing, producing and starring in the movie, but that might not be set in stone. In turns out, there is at least a chance he may walk away from the role of Batman altogether. Following the news that Ben Affleck left the director's chair, Forbes' Mark Hughes wrote a very in-depth piece about his departure. While he made it clear that it seems unlikely, he did note that there is a possibility Ben Affleck could bail on The Batman as an actor as well. Here is what he had to say about it. "Unfortunately, among the things I heard about his departure as director, I heard a few specifics that, if true, lead me to worry there is at least a chance Affleck could also walk away from starring in the picture. I don't feel those concerns are as likely to bear fruit, and I still expect Affleck will finish the screenplay as planned and then start prepping for the role by getting into 'Batman shape' to ensure he's physically and mentally prepared for the role. That said, I do believe there's a chance now that Affleck could depart the project as an actor, winding up merely serving as cowriter and producer." 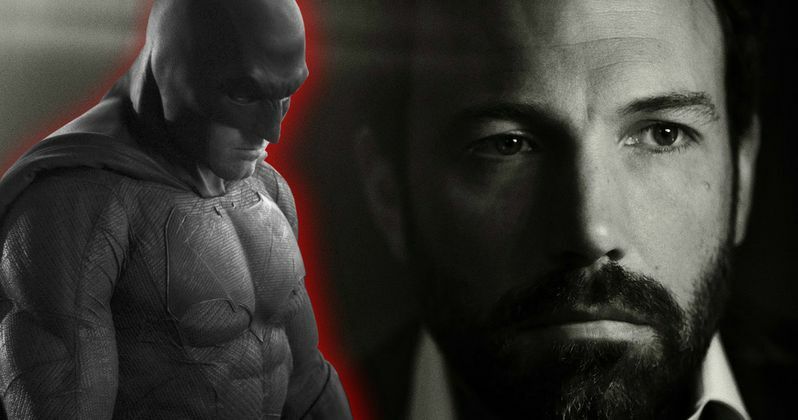 Mark Hughes notes that even if Ben Affleck does see The Batman through to the end, which is likely, the odds, based on what he has heard, have increased that the actor/director could leave the DCEU behind after that movie. Warner Bros. probably signed Affleck to a lengthy, multi-picture deal, but the details of his contract have not been made public. It is possible that, even if he wanted to bail on The Batman, his contract may make that complicated. Again, this is pure speculation, but there is potentially cause for concern at this point. Especially because there have been reports that the script for the movie is something that both Warner Bros. and Ben Affleck are unhappy with. On the flipside of things, Warner Bros. and Ben Affleck were very clear in the announcement that they made this decision mutually and that it was for the better of the movie. It has also been reported that the flop of Live By Night, which has bombed at the box office and was not well received by critics, has forced Ben Affleck to "rethink his approach to his projects." Writing, directing, producing and starring in a movie, especially one on the scale of The Batman, is a lot to ask of any one person, so in a lot of ways, the move makes sense. On the other hand, Ben Affleck is very familiar with writing, directing and acting in his own projects. So, that does raise some questions about why he feels he can't do so this time around. Right now, there isn't necessarily reason to hit the panic button, but things have been a little shaky with the DCEU so far and Ben Affleck taking a step back does raise some red flags. In any case, at least for now, The Batman is still happening and he will still be playing the Dark Knight. We will next see him as the caped crusader in the first Justice League movie, which is due out on November 17. We'll have to see how this all shakes out over the next few months, but Warner Bros. is currently seeking a director for the standalone Batman movie and Dawn of the Planet of the Apes director Matt Reeves is the reported frontrunner. We will be sure to keep you up to date as more details on the project become available.